Crewe midfielder Jamie Ness believes he has got his footballing momentum back during his loan spell at Gresty Road. The 23-year-old Scot arrived from Stoke City in August and has helped the Alex climb out of the League One relegation zone with an unbeaten four-match run. 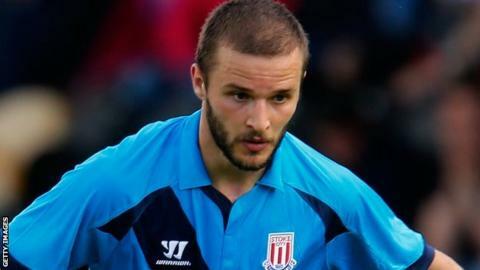 Ness told BBC Radio Stoke: "I'm really enjoying my football now for the first time in a long time. "I feel like I'm getting that momentum back and starting to produce performances I know I'm capable of." Crewe's 3-1 win against Gillingham on Saturday was their biggest win of the season. They have not enjoyed such a comprehensive victory since winning 3-1 at Shrewsbury in April. It was the first time they had scored three times at Gresty Road in almost a year, since the 3-0 win over Sheffield United. Ness, who extended his loan for the rest of the season prior to Saturday's 3-1 win at Gillingham, has played 16 games this season. He scored his first goal in the 1-0 win over leaders Bristol City on 20 December which kicked off the unbeaten run that has lifted them from the foot of the table to 19th place. And he admits that Crewe's talent for developing young players was a big factor in making the short move up the road from the Potteries. "Crewe have the reputation of bringing young players through and playing good football," he added. Former Rangers trainee Ness, who joined Stoke in August 2012, spent the end of last season on loan at League One rivals Leyton Orient. Read more on Peter Crouch: The Premier League millionaire everybody likes?